Wernigerode is a town in the district of Harz, Saxony-Anhalt, Germany. Until 2007, it was the capital of the district of Wernigerode. Its population was 35,500 in 1999. Wernigerode is located southwest of Halberstadt, and is picturesquely situated on the Holtemme river, on the north slopes of the Harz Mountains. 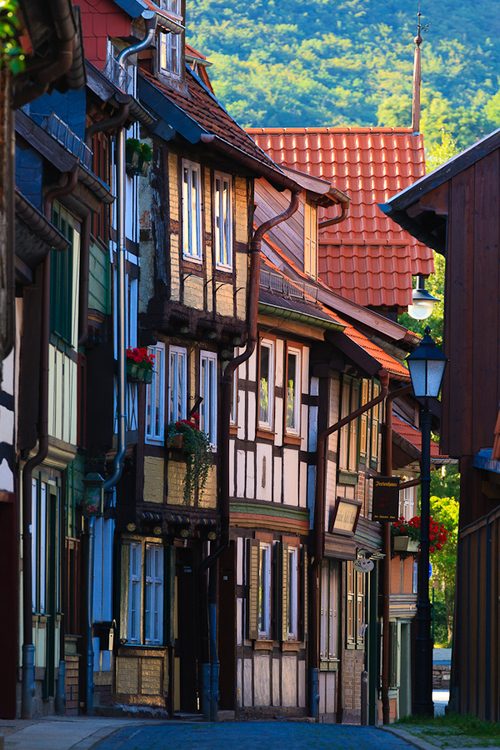 Wernigerode is located on the German Timber-Frame Road. Wernigerode contains several interesting Gothic buildings, including a fine town hall with a timber facade from 1498. Some of the quaint old houses which have escaped the numerous fires through the years are elaborately adorned with wood-carving, The Gerhart-Hauptmann Gymnasium, occupying a modern Gothic building, is the successor to an ancient grammar school in existence until 1825. Brandy, Hasseröder lager, cigars and dyes are among the products manufactured in Wernigerode. The castle (Schloß Wernigerode) of the princes of Stolberg-Wernigerode rises above the town. The original was built in the 12th century but the present castle was built between 1862 and 1893 by Karl Frühling and includes parts of the medieval building.